Every year conscientious homemakers wonder what sort of Christmas table decorations they will have. Every year it seems to be something blasé that’s been done before and not only done before but done by every other house in the neighborhood. There’s always the red tapers and the plastic holly and red plastic berries at their base or the centerpiece featuring the unfortunate ceramic Christmas tree stuck with plastic lights inherited from Grandma. But there are other, more inventive ways to decorate the home for the holidays that are easy to assemble and don’t even cost much. They can be made of unusual materials such as tree bark, berries, fruit, and vegetables. The growing use of LEDs makes it possible to light up Christmas decorations in ways that would have been impractical or even dangerous before. This is because the coolness of LED lights is not a danger to fabrics, leaves or other materials that would burn if placed too close to a halogen or incandescent light. There are even new fabrics and materials to use well beyond the old-fashioned tinsel, cheap red felt and cotton batting. Here are 14 new and exciting Christmas table decorations. 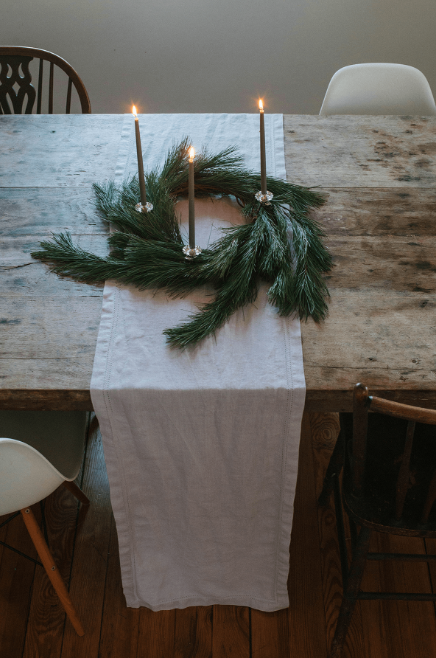 A centerpiece of spruce sprays arranged on gray fabric and decorated with snow-white tapers is simplicity itself. The greenery is echoed in a half-wreath on the wall and the sprigs of spruce tucked beneath the twine that serves as napkin rings. Golden flatware matches the tall, golden candle holders. 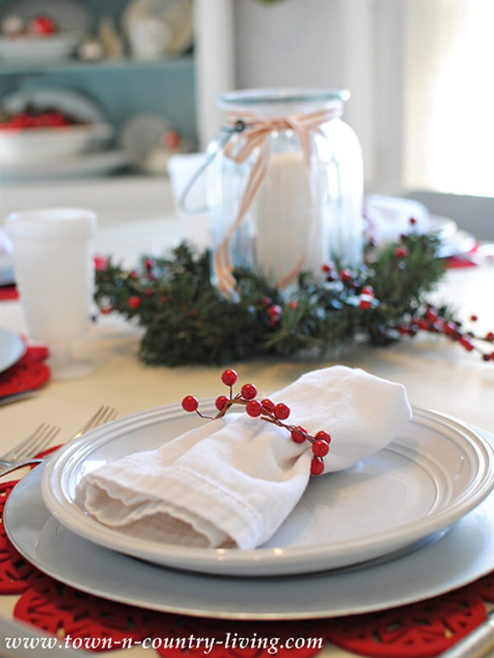 If a homeowner doesn’t want to spread that Christmas fleece on their table, they can simply arrange a bunch of cotton bolls in a tray bordered at both ends by gray-green sage leaves. Numbered white pillar candles add height to the arrangement. 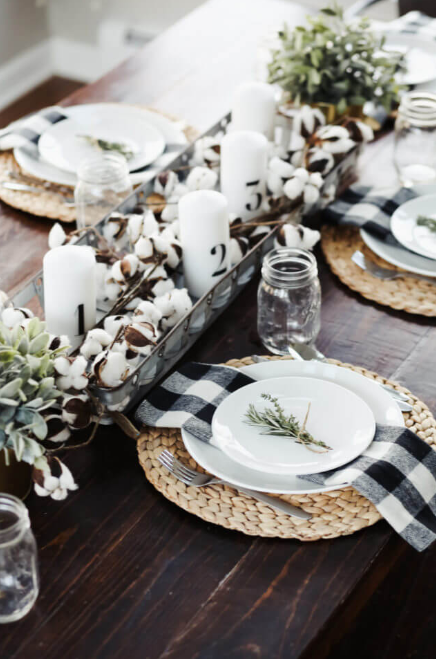 Put dinner plates on bacbac placemats with black and white checked napkins and a sprig of sage and thyme in the center. 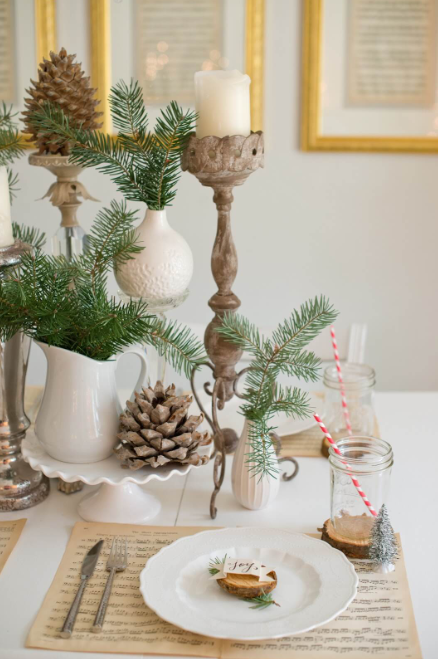 One of the benefits of having a smallish dining room table is that the centerpiece can be its own work of art, with the best creamware vases, compotes and pitchers brought out to hold evergreen branches and big pinecones and old, rustic candleholders to hold pillar candles and more pinecones. One nice touch is to have candy-striped straws in mason jars and the dinner plate put on a reproduction of old sheet music. Maybe it’s music to a Christmas carol. Pillar candles wrapped in paper birch bark join sprays of juniper and pinecones in bringing nature into the home. 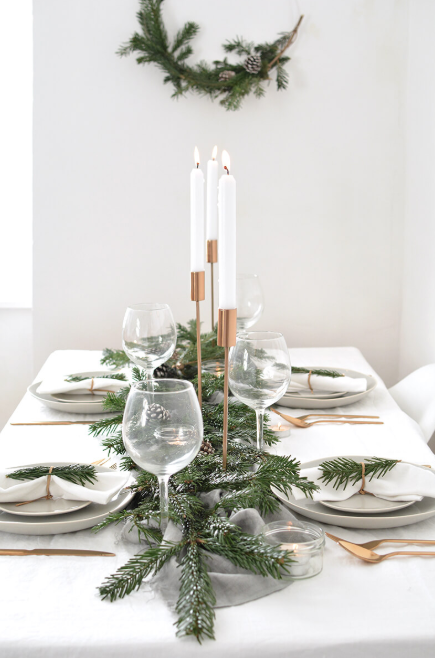 Contrast the pleasingly rough bark with delicate wine glasses, silver goblets, a small arrangement of white flowers and maybe a porcelain reindeer with frosted antlers in the centerpiece. 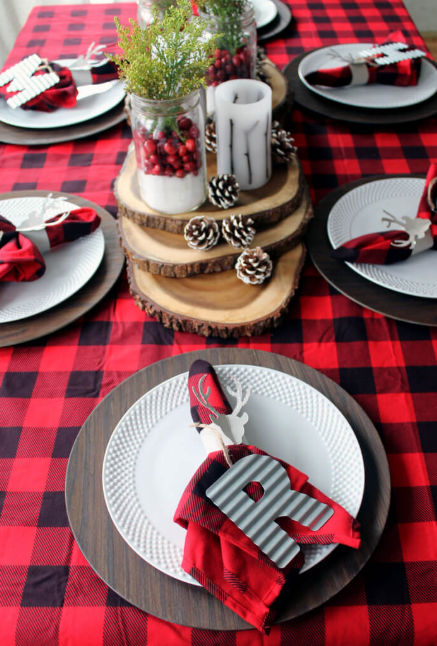 A pretty checked tablecloth pulls all the elements of this arrangement together. 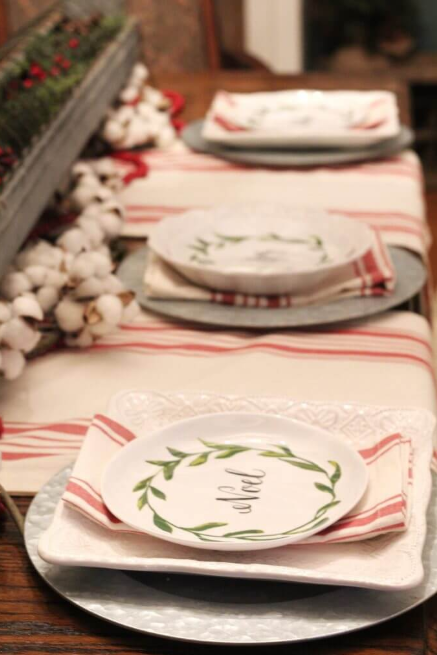 If a homeowner has some good old Christmas plates that have been in the family forever, they shouldn’t be shy about displaying them, corny as they may be. One arrangement is Christmas plates on folded napkins on trays or bowls on chargers, with runners between the plates that match the napkins. 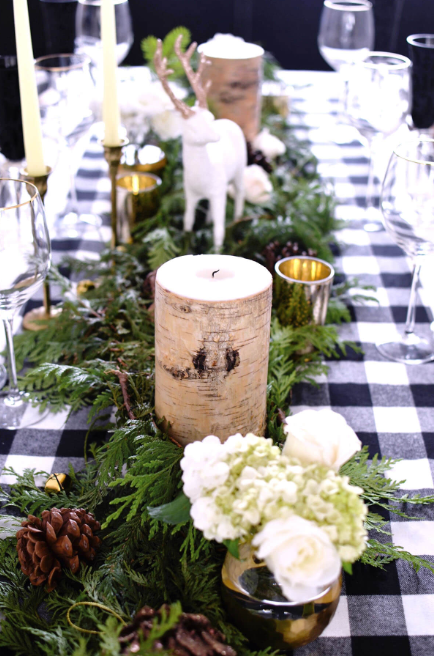 A beautifully decorated table has every element balance each other as is seen in the red and white striped ribbon twined through a spray of pine needles, pinecones, and berries that matches the red and white stripes of the table runners and the red candleholders and white candles. 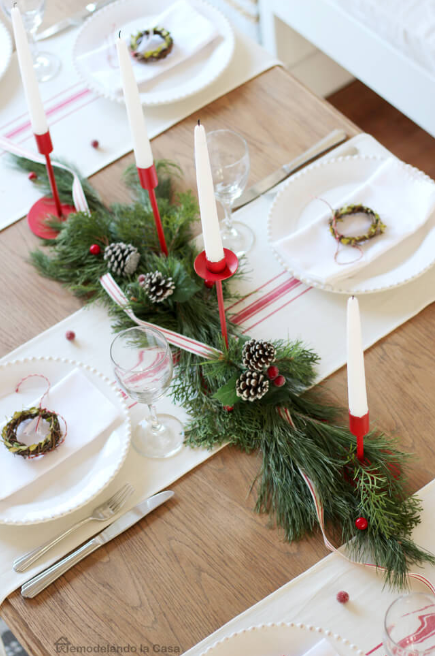 Wreaths small enough to be children’s bracelets add color to clean white napkins and plates. A red and black checked tablecloth is repeated in the napkins found on plates placed on wooden chargers on the dining table. Cardboard reindeer heads holding the first letter of the diner’s name lets everyone know where they sit. For a centerpiece, consider slices of tree bark decorated with tiny, frosted pinecones and arrangements of greenery and red berries. Recalling the plain beauty that might be found in a humble cottage somewhere in Scandinavia, all a homeowner needs to do is make a wreath of pine boughs collected from the forest and decorate them with tall, thin tapers. The runner of pure white linen even gives this arrangement a feeling of holiness. 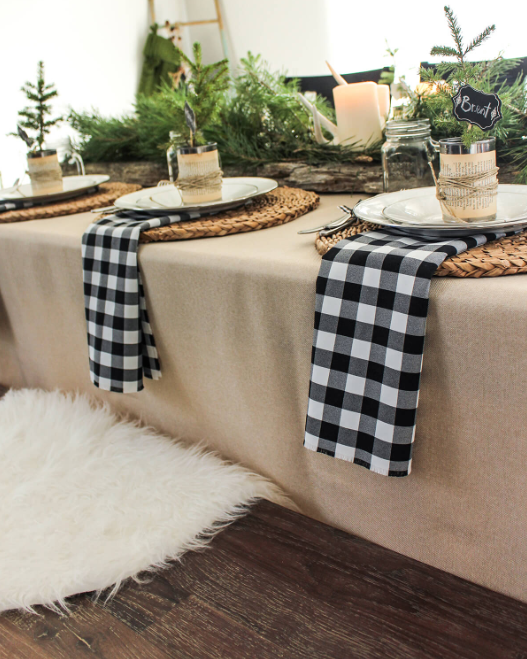 Place big, generous napkins made of black and white gingham beneath plates, and let them hang attractively over the tablecloth. Add to these tankards of Christmas glogg wrapped with raffia and paper and rough-hewn wood decorated with pine needles, miniature evergreens, and candles. The fine china that holds the tankards makes a lovely contrast to the table’s rugged good looks. The white of snow and the red of holly berries are evoked when a segment of vine decorated with berries is used as a ring for a napkin made of the whitest linen. A white plate and charger and cheerful red placemat can complete the look. Don’t be afraid to use white and pops of red around the room. 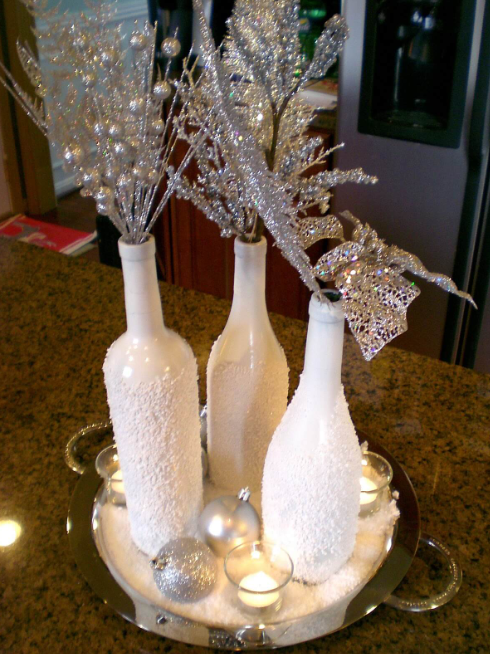 Fill long-necked milk-glass bottles embellished with frost with sprays of lacy, glittery, silvery leaves, balls, stars, feathers or anything else. Place them on an old, polished silver tray decorated with votive candles and silver Christmas balls. This grouping brings the beauty of a winter’s day into the house without the cold. 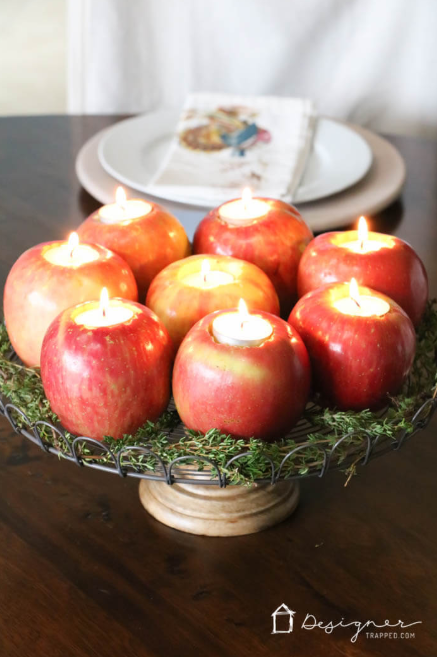 One stellar idea for Christmas table decorations is to insert votive candles into cored apples. Apples can be green, red or a combination of colors. It’s best if they are on the round side so they can sit comfortably in a tray filled with moss. Lady apples are ideal to hold votives as are Novamacs, Granny Smiths and Fujis. The deep ruby red of cranberries contrasts beautifully with bunches of white or cream flowers that have just a touch of green in them such as hydrangeas. 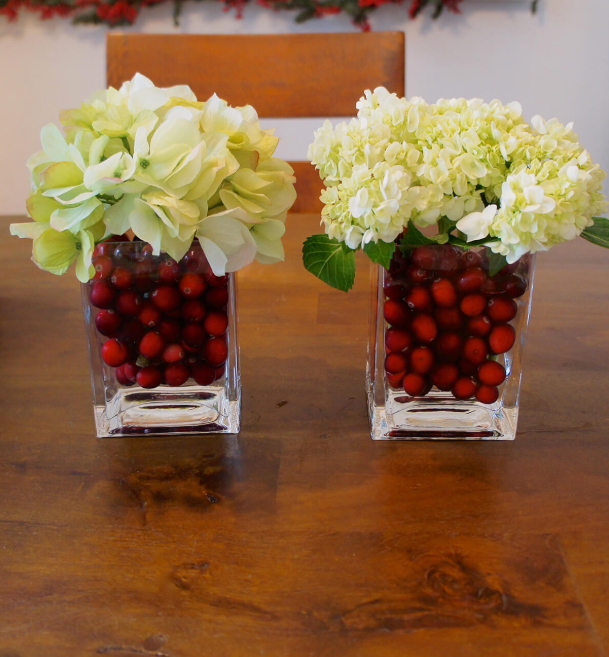 Just fill up clear glass containers with the cranberries, add water and arrange the flowers on top. A holiday table won’t need much more than this to bring the Christmas cheer.